Fuel economy numbers have been a problem in the past for Kia and Hyundai, owned by the same parent company. In November 2012, the two automakers confessed to overstating fuel economy numbers to the tune of 900,000 vehicles and made payments to owners. Ironically, according to a CNN.com story, the vehicle singled out for the most-inflated fuel economy numbers was the Kia Soul. It had its highway fuel economy numbers dropped 16% from 35 mpg down to 29 mpg. Still a good number but not quite as good as first claimed. Now Brad Berman, writing at plugincars.com, says, "It looks like Kia has fallen into the trap of over-promising range—based on its announcement that the size of the battery pack will be 27 kilowatt-hours. 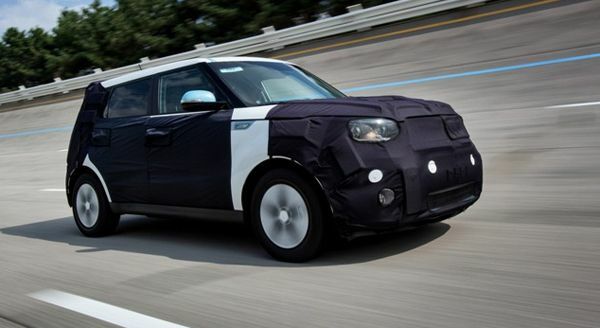 The 2014 Kia Soul EV is more likely to deliver real-world range of between 90 and 100 miles." Berman is basing his estimates on a energy production formula for electric vehicles. "I rely on a general rule of thumb that places average efficiency of an EV—which is vastly more efficient than a gas-powered internal combustion car—at 3.5 miles per kilowatt-hour. That would mean 94.5 miles of range on the Soul’s 27 kWh pack," he wrote. There's also the problem of the Kia Soul EV's design. In an earlier article, I faulted it for not looking enough like an electric vehicle to attract the relatively small segment of the auto-buying population that is willing to make a break from the gas pump. Berman says the Soul EV also is going to suffer from not being aerodynamic enough to achieve full efficiencies. But, and this is an interesting observation, the folks at plugincars.com feel the design might actually help the Kia sell more of the Soul Electric Vehicles because younger drivers find it more appealing. In my opinion, that's not necessarily going to be the case. The average age of a Kia Soul buyer is 48. The hamster campaign is credited with dropping that age from 50. It's still going to be older drivers buying the Kia Soul Electric Vehicle because the average age of any new car buyer is still in the high 40s. Having said that, I agree with plugincars.com that Kia is going to be more realistic going forward on its mileage claims if it wants to attract happy buyers. I drove the new Honda Fit EV this fall. Despite the EPA and Honda estimates, the test car was getting a range of about 45 miles. It also was on the charger for day one of the 2 day testing event. EVs don't work as advertised. I think it depends largely on who made it and what their claims are, John. I drove the Fiat 500e this summer and its claimed range is pretty close to its real-world range if it's driven on light highway and in the city as it's designed to do. The Ford Focus EV has a tough time holding its range claims, but I think a lot of that has to do with its inherently sporty nature that encourages inefficient driving habits :) The Nissan LEAF largely lives up to its expectations (I've now driven it multiple times) as well. My greatest concern with EVs for now is longevity of the battery pack and cost of replacement. The only Leaf I drove was an early production model and at that time the range indicator went up and down so much it was a real negative. I think the reason that almost all the new EVs are being promoted with lease deals is due to your last comment about lifespan of the drivetrain. After all, the point is to get the EV credits. Which the automaker gets with the "sale" of a long lasting battery, or a short lasting battery. That said, the hybrid batteries (Nickel metal hydride mostly) are proving incredibly robust. Time will tell. The LEAF has improved immensely since the first prototypes. I was pretty disappointed with the first ones as well, but the 2012 and 2013 models are spot on. They've figured out what the market wants and are delivering that, which is why they're still the best-seller. The Prius moved to li-ion a couple of years ago when their contract with GM to use the patented NiMH was running out. NiMH is relatively heavy and harder to manage (in terms of battery cycling) than is lithium and produces more heat. It is interesting to note that most manufacturers of EVs were not offering battery warranties until CARB started requiring them. EVangelists need to realize that the technology is still very new. Sure, it's been in your laptop and phone for years, but there's a big difference between the power usage of your gadgets and the usage requirements of an automobile capable of highway speeds. Hi, Kia claims that their battery has 46% higher density than the Nissan Leaf, plus we know that their battery is 12.5% larger. Now let's assume for argument's sake that the Kia Soul is 10% less efficient than the leaf because it's heavier, not purpose-built and less aero-dyamic. In that case we would get an estimated range of: 84 miles (Nissan's EPA range at 90% charge) * 1.46 *1.125 *0.9 = 124 miles, which matches exactly Kia's claim. I'm hoping that my calculations are correct, and if they are I'll buy a Kia Soul! I purchased a 2016 Soul EV back in July. At that time I remember 80per cent charge displayed 120km. Six months later, after a couple of cold periods in December, now a 80 per cent charge drops to 87 km. I am thinking of approaching Kia Canada for warranty. In the meantime, I would not suggest a Kia Soul EV to anyone.